We conclude our three-part exploration of Wowa Cwjeman's new range of exclusive analogue synth modules. By the time you read this, Wowa Cwejman's first Eurorack-based modules will have been available for many weeks, and I have no doubt that early adopters will have formed strong opinions about them. As you know if you read my reviews of the VM1 Voice Module (SOS December 2006) and the dedicated VCO, VCF, VCA and EG modules (SOS January 2007), I was impressed with the engineering quality, design, power and flexibility of all five products, while noting that they still fell short of comprising a complete, self-contained modular synth. So this month, we're going to look at three further modules that fill some of the gaps in the range: a dedicated LFO module, a dedicated ring modulator, and a three-band 'formant' filter module. Although the modules reviewed so far have lacked a dedicated LFO, the VCO2 RM module more than makes up for this with low-frequency modes on both its oscillators. Nonetheless, Wowa Cwejman seems to have decided that a conventional oscillator doing its thing slowly is, in itself, not sufficient to earn the right to be called a low-frequency oscillator, and he has designed the DLFO to provide almost any variation on low-frequency analogue waveforms you might care to mention. He started with two LFOs, each offering seven waveforms, and gave them two ranges: without CVs applied these are a super-languorous 40s (0.025Hz) to 0.4s (2.5Hz) and from 0.2s (5Hz) to 2ms (500Hz). He then gave them CV inputs with 'amount' controls, and made sure that at 100 percent they both tracked 1V per octave nigh on perfectly, so that you could use either or both as audio-frequency oscillators! He then sync'd LFO2 internally (as slave) to LFO1 (as master) but also added two types of external sync input to each oscillator. Although there's no documentation to describe the difference between the two, I found that the results of applying a signal to 'Sync T' produced somewhat more aggressive results than offering the same signal to 'Sync G' with otherwise identical settings. Oh yes... and the nature (and therefore the sound) of the resulting sync'd signal can be altered by determining where in its cycle the slave is re-triggered, either manually using the knob, or using another CV applied to the appropriate input. If this weren't enough, the DLFO also incorporates a ring modulator! This offers both ring- and amplitude-modulation modes, and is pre-patched to LFO1 and LFO2, but also offers a signal input that breaks the LFO2 signal path. The range of audio routings available using this architecture is greater than it might seem. For example, you can use LFO1 as a conventional audio signal generator, playing it using a standard 1V/octave pitch CV. At the same time, you can use LFO2 as a conventional low-frequency oscillator or as an audio-frequency oscillator for modulation purposes (although you'll need an external mixer if you want to apply this to LFO1). Next, you can apply an external signal to the external input of the ring modulator, creating all manner of complex tones by modulating this with LFO1. If you then use LFO2 to modulate the external signal, everything gets more complex still. Now mix the three outputs from the DLFO and... well, I'm sure you get the idea. Investigating the output from the DLFO shows that some of the waveforms it generates are the same as those you obtain from the VCO2 RM module. Audibly, they seem the same and, more tellingly, there's the same blip on the sine wave and the same shark's tooth profile to the sawtooth waves, so I would not be surprised if they were generated by the same circuit. The primary differences between the two sets of oscillators lie, therefore, in the waveforms that are not common to both. In particular, the LFO module dispenses with the mixed waveforms of the VCO2 RM and with pulse-width modulation of the square wave, and produces what Cwejman calls Sample & Hold and a slewed (smoothed) version of the same waveform. As far as I can see, these are misnamed. There is no input to insert a signal to be sampled, so these waveforms would be better described as 'Random' and 'Random With Slew'. The other five waveforms are sine, triangle, sawtooth, ramp and square. Further differences lie in the number of CV inputs (the VCO module has lots) and the range of sync options (the LFO modules has lots), so it's clear that — despite both modules' abilities to produce audio-frequency and low-frequency signals — they are distinct products that will satisfy different needs within your modular synth. Having said that, there are also many applications where you could use them interchangeably. Finances notwithstanding, perhaps it would be best to have one of each! Wowa Cwejman must really love ring modulators because, despite offering the two already contained within the VCO2 RM and DLFO modules, he has added a dedicated ring modulator module to the range, the RM2S. You might ask why a modular synth might need yet another RM. Then again, you might not, because getting a free ring modulator with every dual-oscillator module and dual-LFO module means that you soon start to own more ring modulators than you will ever need. 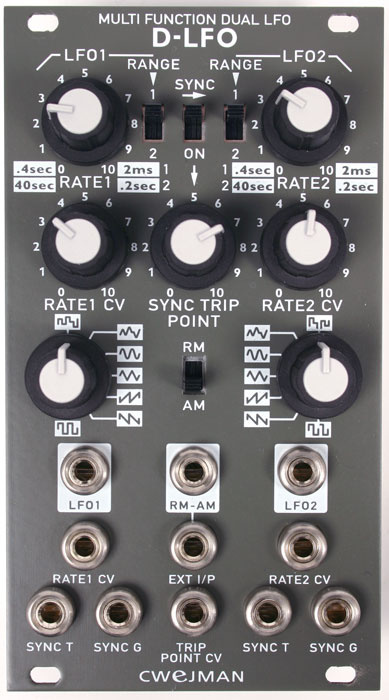 Nonetheless, Cwejman has decided that there's a need for the dual-modulator RM2S, perhaps to add to existing modular synths from other manufacturers. Unlike many dedicated ring modulator modules, the RM2S incorporates an internal carrier wave (slave) generator. This is a very pure sine-wave oscillator that produces two signals, A and B, that differ only in their phase: signal B lags behind signal A by 90 degrees at all frequencies. As is standard on all Cwejman's modules, this oscillator has two ranges, LFO and Audio, and you can 'play' it perfectly using the 1V/oct CV input. The oscillator's two output signals are directed internally to the Left and Right ring modulators although, again as is becoming standard on Cwejman modules, you can break the internal patching by inserting cables into the YCGA (Carrier Generator A) and YCGB (Carrier Generator B) sockets respectively. You then insert the master signal into the XL and XR sockets and, if you want to affect a single master signal using both ring modulators simultaneously, the XL input will provide the master signal to both modulators if you remove any cable from XR. You can then inject an extra layer of complexity using the Level CV inputs for each modulator. The most obvious application for these is to control the contribution of each of the resulting signals to the final mix, but you could apply audio-frequency signals here, thus applying audio-frequency Amplitude Modulation to the ring modulators! You'll find this architecture on Cwejman's flagship S1 MkII synth, and if you're a fan of unpredictable effects, it could be right up your street. Sonically, the quality of the modulators seems to be very good. The sine wave produced by the Carrier Generator is much purer than those generated by the oscillators in the VCO and LFO modules, and if I had to describe the sound of the modules, I would say that it is very smooth. But why put two modulated modulators next to each other in this fashion? The answer lies in Cwejman's use of the word 'stereo' in the product description. If you insert a single signal (or two closely related signals — say, the positive and negative outputs from a single VCO2 RM oscillator) into the 'X' inputs of the stereo ring modulator, and use the Carrier Generator to modulate the amplitude at low frequencies, you obtain a panner, albeit one that responds to all manner of complex modulation signals. If you switch the Carrier into audio-frequency mode and sweep its frequency, you find yourself in 1950s sci-fi territory, or you would, had they made movies with stereo soundtracks! You can then inject signals to the Level inputs of the two modulators to further complicate the stereo image. However, this is where I found my only problem with the RM2S; the responses of the two Level inputs were very different, with the left modulator responding much more deeply than the right. I removed the module from the case to see whether I could correct this using some form of input gain adjustment. Sure enough, seven trimmers are visible through the cage that protects the electronics but none of these are labelled, so I was unable to find out whether I could correct the problem. This is where Cwejman's lack of documentation is a real pain, because — given the engineering standards of all these modules — I am confident that the correct response was just a gnat's twiddle away. It's just that I didn't know where to twiddle. The human vocal tract is a complex filter with many spectral peaks called 'formants'. The properties of these formants — centre frequency, bandwidth ('Q') and amplitude — are determined by anatomical features such as the lengths and volumes of your larynx, mouth, nose and sinuses, and it's these that make it possible for us to produce vowel sounds such as 'eee' and 'aaah'. However, the frequencies of human formants are not related harmonically, so it's not possible to synthesise this class of sounds using single filters such as comb filters, or the harmonically-related multiple filters found in graphic EQs and fixed filter banks. Experiments showed long ago that to create vocal (-type) sounds you need a number of band-pass filters whose frequency, bandwidth and gain you can control independently. Furthermore, the minimum number of filters required to produce intelligible vowels is three, which is why many manufacturers of modular synths produce three-band, voltage-controlled filter banks known as 'formant filters'. A single audio input provides the input to the module, and a single output sends the results to the destination of your choice. Unfortunately, Cwejman seems to have made a mistake at the input. If you insert the output from a VCO2 RM oscillator (or one of the oscillators from a DLFO in its audio frequency range) directly into the audio input, you overload it, and the warning LED lights immediately. More to the point, clipping occurs. I've mentioned before that a purely Cwejman modular synth will need numerous mixers and multiples to be useable, and to this list I'll now add some dedicated attenuators. It's hard to patch a convincing 'eee' or 'aaah' sound, but the VCEQ3 will create passable emulations when you use an attenuated pulse-width wave as the input signal. If you're prepared to create some complex patches with lots of CVs, the extra control over bandwidth and gain for each of the filters should also make it possible to approximate a human voice more closely than on other filter banks. But (you just knew that there would be a 'but', didn't you?) the CV inputs are unattenuated, so applying the signal from, say, a DLFO results in far too great an effect. To be fair to Cwejman, adding 10 attenuators — one for the audio input and nine for the CV inputs — would be a serious undertaking, but the module could have benefited greatly from the addition of global CV control over frequency, bandwidth and level of the three bands. It would then have required just three attenuators which, while not as flexible as nine, would have been an excellent addition. Indeed, if he had followed his usual philosophy, Cwejman could have made the inputs for Band One global until you inserted patch cables elsewhere, but on this occasion he has failed to do so, making it necessary to use another manufacturer's multiples if you want to sweep the three filters' frequency (or, for that matter, bandwidth and/or gain) simultaneously. All of which brings us to the issue of filter-sweep effects. This is the second raison d'être of triple-band filters, which can be used to create all manner of stereo effects as well as phasing- and flanging-type effects. Using the 'A' and 'B' signals generated by the RM2S Carrier Generator, I created some pleasing filter sweeps, but stereo effects are forever beyond the reach of the VCEQ3 because it has just a single audio output. Notwithstanding its limitations, the sonic quality of the VCEQ3 is very good, and the filtered sound is never less than smooth and appealing. However, before rushing out to buy, this is one Cwejman module where you might like to consider the alternatives. For example, Analogue Systems offer a similar module, the RS360, but each of its three filters simultaneously provides low-pass, high-pass, notch and band-pass outputs that you can direct to different destinations within the synthesizer, for a much wider range of signal processing effects. In a different vein, the Doepfer A127 has just a single profile (band-boost, with a significantly narrower range of frequencies than the Cwejman) but adds a dedicated triangle-wave LFO to the cutoff frequency of each filter. On the other hand, neither the AS nor Doepfer modules offer CV control over bandwidth or gain, which the Cwejman module does, so I'll leave you to decide which of these (or the alternatives from elsewhere) is the most suitable for your needs. At first sight, each of these modules appears to be more expensive than the Eurorack equivalents obtainable from elsewhere, but a comparison with the leading British manufacturer shows that such a comparison isn't quite as straightforward as it seems. Ignoring the considerable differences between the two set of products, a pair of British LFOs and a ring modulator would cost £217, while the DLFO retails for 388 Euros, which is about £270. 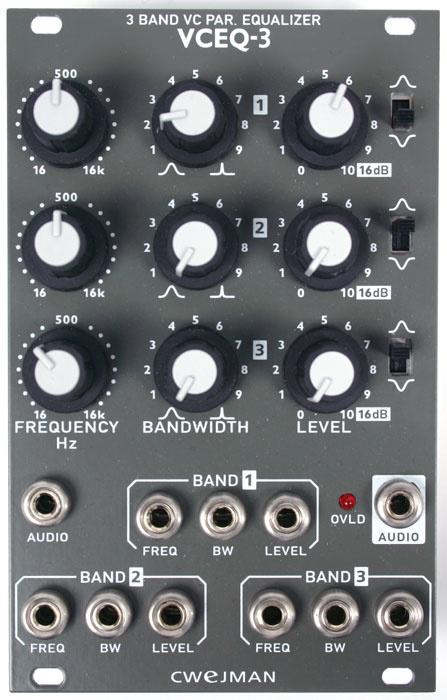 More strikingly, the British three-band filter is significantly cheaper, at £199, than the VCEQ3, at 396 Euros (£275), but a pair of British ring modulators plus an oscillator to provide a carrier would set you back £225 compared with 319 Euros (£220 or thereabouts) for the RM2S. So the prices are not as different as you might think. Furthermore, the Cwejman modules are designed and built to particularly high engineering standards, and you may well prefer the Cwejman's painted panels to the brushed aluminium fascias provided by other manufacturers. Nonetheless, you would still be ill-advised to try to construct a complete modular synthesizer from Cwejman modules alone, if only because you would immediately find the lack of mixers, multiples and attenuators to be very limiting. But as high-performance additions within a mixed-manufacturer modular synth, the Cwejman modules are superb, often offering superior sound-shaping and performance possibilities. So will we ever be able to build a complete, self-contained Cwejman modular? There are five additional modules in the pipeline at the time of writing, and four of these will offer sound-creation possibilities that I suspect may be unique to Cwejman, but none contain the 'bread and butter' facilities that are currently missing. I just hope that Wowa Cwejman will get round to producing the missing bits and pieces, because I suspect that a pure 'Cwejman Modular' would be a remarkable synthesizer. 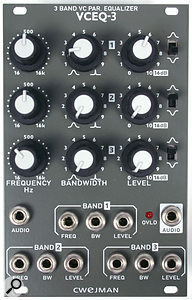 DLFO Dual LFO (75mA) - 481 Euros. 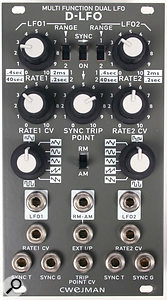 RM2S Stereo Ring Modulator (35mA) - 390 Euros. VCEQ3 Voltage Controlled EQ (75mA) - 494 Euros. Very powerful additions to existing modular systems. Some unique sound shaping ideas in the DLFO and RM2S. They maintain Cwejman's high engineering standards throughout. You will need external multiples, mixers and attenuators to be able to use them fully. As always, Cwejman's modules enlarge upon the basic principles and, despite one or two omissions, offer a number of facilities not found on equivalent products from elsewhere. Add any of these modules to a Eurorack-based synth and you will extend the range of sounds that you can get from it.